Normally when I journey to St. Albans I have no fear about leaving my car outside my parents house. After all, I’ve driven all round the country and of all the places I’ve been I’ve always considered St. Albans to be one of the safest places to leave a car. How shocked was I then to find that in the early evening on Saturday before I left for the cinema with Hannah but after it got dark, that some cretin had stolen the aerial from the roof of my car! I know it wasn’t vandalism as they had actually got a little spanner and purposefully unscrewed it, leaving the base intact. Thankfully a replacement was easy to come by on eBay for a tenner or so (it’s being delivered later this week) but the fact that the item is available for such a price beggars belief as to why anyone would bother to steal one. I guess it’s the annoyance rather than anything else – I’ve gotten so used to driving with some radio station or other on in the background that doing so with just the traffic noise for company was a little strange to say the least. 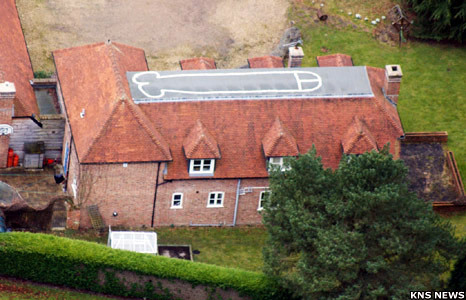 Could you imagine checking out an aerial photo of your house on Google maps and finding this on the roof of your house? An then later finding out it has been there for a whole year? According to this article on the BBC, this is precisely what happened. It also looks like the youth responsible is going to get in serious trouble when he gets home. At the end of my training course yesterday I headed back towards St. Pancras but instead of boarding the first available train back to St. Albans I grabbed a coffee and a table at the Costa Coffee on the concourse and waited for Laura to arrive from work. Recently I’ve been catching up a lot with old friends but considering the time Laura and I used to spend (usually in the pub) musing over current events and discussing what the future might hold, it really was great to be meeting up again. We did the usual “not understanding why we hadn’t spoken for so long”, “promising to call more in future” and such like but actually I genuinely think we will keep in touch this time. Talking about the old times binds us together but being able to see how far we’ve come since those student days of over indulgence in alcohol and other craziness was just as good fun. After coffee we also took the time to wander round St. Pancras station and for the first time I noticed what an amazing building it is. Usually I hurtle through from one end to the other, in search of some train or tube, but staring up at the arches of metal and the huge station clock at the end of concourse made me realise that things we look at ever day and pay little attention to may have more to them than at first meets the eye. Next time you’re in St. Pancras, look up. I don’t think you’ll be disappointed. Last night I headed out to meet my friend James and got to meet a couple of old friends into the bargain. Adam James I hadn’t seen in a number of years but Graham Free I hadn’t seen literally since the day I walked out of the school gates. It was nice to catch up with both of them and find that they were both doing well in their respective study and career exploits. I was also pleased to make the acquaintance of John Hargreaves, a good friend of James’, with whom I found I had a number of hobbies in common. Sailing, real ale and 80s music to name a few. I hope to be able to stay in touch with these people and hopefully meet up again upon my next return to St. Albans which is unlikely to be too far into the future. Two weeks ago I enjoyed a week long break from work and headed out to Austria for a skiing break with a couple of old friends from my school days, Matt Kirk and Ed McIllwraith. Despite not having been skiing abroad for a number of years I got in practice before hand by visiting the xscape snow dome in Milton Keynes and was fully ready for the trip by the time I boarded the plane. The trip was better than I could imagine and while my intense skiing activity left considerably less time for photos I still managed to make the most of the resort and the activities on offer. I succeeded in completing all the black runs in the resort and got a fair chunk of off-piste skiing done, including what Ed described as a spectacular stack after hitting a tree stump submerged by snow that saw me go head over heels 3 times. I was OK though and in a strange kind of way it made the trip even better. The holiday reminded me how much I enjoy skiing and the winter scenary and I definitely think I’ll be trying to get a trip organised again next year. If you’ve never tried skiing you should definitely get some lessons and give a trip a go – you won’t regret it. I went to St. Albans for mothering Sunday and a large number of family members joined us all for a meal in town. I managed to get a few snaps while we were there. I recently posted a number of photos I’ve taken over the past few weeks but realised I had forgotten to make this fact known in a blog post.